The Listies rolled out the first of their silly lists of comical things Ickypedia to audience members at the Arts Centre Melbourne today and the kids lapped it up. The Listies present Ickypedia features a new language of mixed-up words to explain all things gross and silly. The show is based on the comedy duo's book of the same name, and it's downright absurd, ridiculously funny, and right up every child's alley. There's toilet humour from start to end; poo, fart and snot jokes aplenty and references to modern-day kid trends; fidget spinners, dabbing, and not being able to use the iPad without cleaning one's room that relate to all the kids (and grown-ups) in the audience. There are no elaborate stage sets nor glitzy costumes in Ickypedia but that's OK because there doesn't need to be. Just like any great comedy show you are likely to see live, this hour-long performance is all about about the delivery of jokes than it is the visuals. Having said that, there are a few stage props (or should I say plops!) that are necessary additions to highlight to the silliness of the Ickypedia and the inclusion of all audience members later in the performance, much to the kid's delight. Big KidTown Melbourne laughed lots during Ickypedia and so did I. While Mini KidTown didn't really understand some of the jokes (the show is recommended for 4yrs plus, and he is not quite there yet), he giggled at moments throughout the performance, too. How could you not, really. Matthew Kelly and Richard Higgins who are The Listies are award-winning comedians and it's no surprise why! 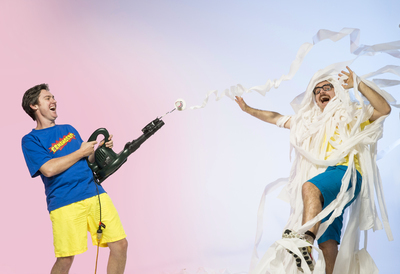 The Listies are no strangers to kid-centric comedy with such shows as The List Operators for Kids: More Fun than a Wii!, The Listies Do Compooters, Earworms, 6D (Twice as Good as 3D), The Listies Make U LOL and The Listies Ruin Xmas under their belts. 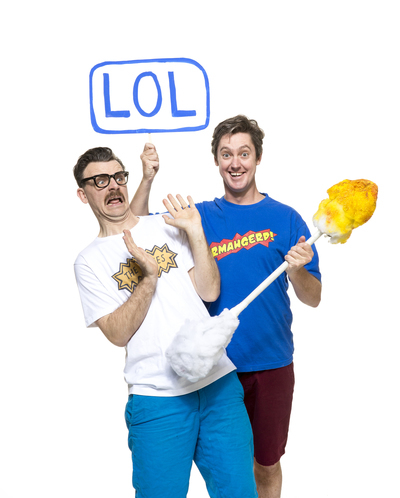 While I can't vouch for the previous aforementioned shows because this is the first time I've seen The Listies perform live, what I will say is that Ickypedia is a hilarious show that is sure to appeal to most primary school aged kids from SMELL-bourne and beyond this winter! 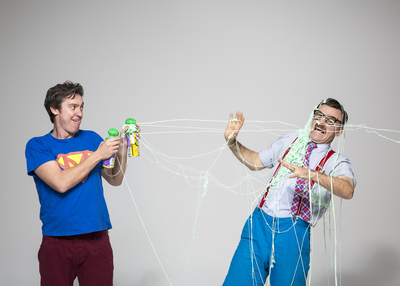 Go and see The Listies present Ickypedia in the warmth of the FART Centre Melbourne this winter and enjoy some LOLs with your kids. Book: artscentremelbourne.com.au or call 1300 182 183.